It’s rare that plays on Broadway get as much buzz as the blockbuster musicals. The Curious Incident of a Dog in the Night-Time is the exception to that rule. Winner of five Tony Awards in 2015, including Best-Play, we had heard about this play for a while. So when we were heard the tour was going to SHN’s Golden Gate Theater, we were excited to see it for Drama Talk & Drinks. Katie: Wow, I couldn’t look away. I was so engaged, and intrigued, and invested in Christopher [The lead character -Ed.] and his story. Even though at moments the plot was predictable, it didn’t matter because it was such good story telling. I was interested in the whole family. The actor who played Christopher (Adam Langdon) was so incredibly talented. The set was innovative and propelled the show forward, which is a hard thing for a set to do. I just really enjoyed it. Brittany: I agree. It was one of those shows that, although it wasn’t pleasant to watch because of the intense sound and lighting design, it’s just too good not to. I thought the way they used the lights and sound to put the audience into Christopher’s head was so innovative. It’s hard to say it’s enjoyable, because when you’re getting blasted with strobe lights and loud screeching noises it’s definitely jeering, but it’s such a powerful story and creative production. K: Totally, for once I can’t think of anything to criticize. I was just really moved. B: They showed a lot of humanness. It’s wonderful that a show told from the perspective of a 15 year old boy who is on the autism spectrum is one of the most empathetic shows I’ve seen. You could totally understand why all the characters in the show did the not-so-pleasant things they did, and feel for them, even while knowing that they were making selfish or wrong decisions. K: It got messy, but it was so good.The show was engaging, you didn’t really have time to think of anything else, but be present and watch this story about these very imperfect people unfold. It’s definitely a must see. The Verdict: GO SEE IT! It’s not an “easy” show, there’s some uncomfortable moments, but it’s such a well done play it’s worth a little discomfort. The Drama Talk: When you walk into the theater, there’s a dead dog in the middle of the stage with a pitch-fork stuck in it (a ‘garden fork’ in the script – it’s set in the UK). The play’s plot never gets much lighter than this, but still somehow, there’s a joy and lightness to the production. The performance puts the audience into the mind of a 15 year old boy, named Christopher, who is a math savant but “ill-equipped to interpret everyday life”. The set is remarkable, with LED lights and built in projections that transport the viewer to the different settings of the show, but also into Christopher’s thoughts and fantasies. While the show isn’t “immersive” in the sense that the audience never leaves their seats, it does transport the audience into a different sort of consciousness. When Christopher is panicked, the play uses lighting and sound to induce a similar sort of emotion in the audience. While it’s not always comfortable, it’s definitely memorable, and makes for a moving night at the theater. The Drinks: After the show we decided to check-out a bar we hadn’t tried yet, Rx, a ‘apothecary themed cocktail lounge’ a few blocks uphill at the corner of Geary and Leavenworth. It was a cozy and chill spot to grab a strong fancy cocktail and unpack the show. 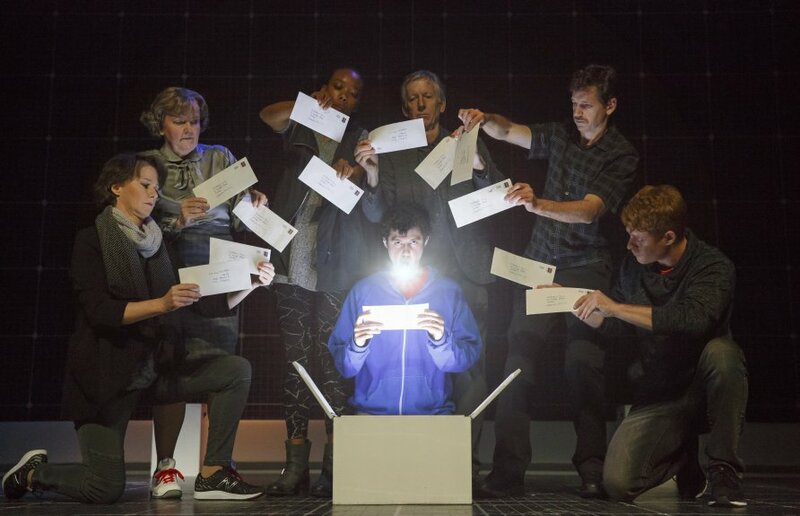 A Curious Incident of the Dog in the Night-Time runs through July 23rd at SHN’s Golden Gate Theater. Tickets range from $55-$200 on the SHN website. There are also a limited number of virtual rush tickets that are available through the Today Tix app, and a limited number of $35 Rush tickets available via an in-person rush, beginning 2 hours prior to curtain at the SHN Golden Gate Theatre Box Office. Note, the in-person rush tickets are cash only with a 2 per person limit. At time of publishing there are still some $40 Goldstar tickets available for the show too.